Modern fishing reels are made of titanium, aluminium alloy, and high-strength steel. However, it will undergo numerous changes due to mud, dirt, sand, and salt. These factors will damage a fishing reel and eventually, it will become unusable. Some people want to keep their old fishing feels without cleaning. However, some others always want to maintain their reels in good condition. 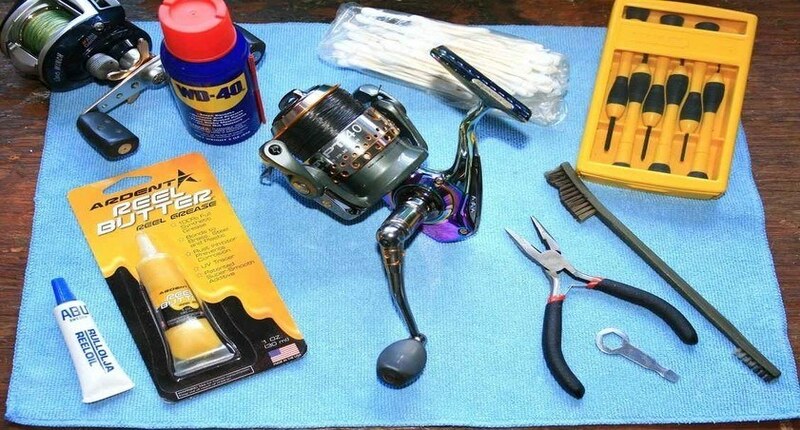 This article, How to clean Fishing Reels, is highly useful if you like to rediscover the tranquillity and peace of fishing with clean reels. In order to clean the old reels easier and faster, you should have the right tools at your hand. Before cleaning your reel, it is essential to examine it to find out whether it is damaged or not. The following are the tools essential for cleaning fishing reels. All items should be arranged on your workspace before you start the reel cleaning process. If you arrange all the things in order, you can avoid misplacing of tiny screws. At first, you should disassemble the reel partially or fully. However, you should do it only if the reels are in good condition. Some older reels will break when you take it apart due to the exposure to harmful elements or rust. If you are not able to remove screws easily, then the outer surface should be cleaned. You should take care of the small screws while taking reels apart. Reels should be removed by using proper screwdrivers. You should clean outside of old reel on the basis of the part of the material. You can wipe the outside of all materials by using mild dishwasher soap and a damp rag. The nickel-plated or brass reels should be soaked in vinegar for 30 minutes to one hour to remove discoloration. Then, you can wipe them with water and soap. Dirt and grime from internal parts can be removed by using water and soap. A cotton swab should be used for tight areas, stubborn grime can be cleaned by using a toothbrush. The smooth operation can be ensured by applying lubricant. It is very easy to oiling reels because it is already open. The oil should be specifically designed fishing reels. You should place a drop of oil on each bearing. You can use a toothpick for doing this task. A few drops of very thick reel grease should be placed at below the gear teeth for lubricating them perfectly. It is not good to use WD-40 because it is meant for removing grease and oil from the interior and it will not lubricate it. You should place all the items in order during the process of removal, which is essential for putting back the reel together very easily. You should start with the part you removed last. It is essential to continue the process in reverse order. The case should be placed lastly. The Proper screwdriver should be used for screwing the items. You should test your reel after finishing all works, which is helpful for fixing improper items if any. You need not take your reel apart and clean it after every use. However, cleaning is necessary if you do not use it for a long period of time. Outside of your reel should be wiped down after each fishing season. You can use a damp cloth and a mild soap for removing salt or dirt. Multi-purpose oil like WD-40 can be used for misting exterior lightly. The excess oil should be wiped off for preventing rust between uses. You can clean your fishing reel very easily if you read this article, How to clean Fishing Reels, very carefully.